breathtaking how every Martian has been integrated. At 07:20 we were together at the lower deck to do some relaxing exercises in the lead of by David, who also cleaned the Hab with Luis. At 08:00, we ate breakfast together while we did the briefing. operations, so the routine of each EVA was to walk over even terrain, then drive using ATVs and Curiosity; and finally we made summit in Overlook Reach. The first group of the EVA was conformed by Atila, Oscar Danton and I; their time of donning started at 11:00 until 11:30, in that moment the real adventure began and lasted until 13:00. Later, in the habitat they gave advices to the following group of EVA. The second group was conformed by Atila, Tania, Luis and David. Their expedition lasted until 15:30. Both EVA was led by Atila. After each EVA, the crew started to exchange their feelings about to be in a real expedition, that feeling of been a Martian is unique! By the way, between the 2 EVAs, at 13:20, Tania and I, went to the Musk Observatory just to check the status. As lunch, Oscar cooked rice with cheese and meal, it was a delicious lunch! Later, Shannon visited us to explain about the map on Mars. She suggested us to visit wonderful places like Copernicus highway, Lith canyon, Tank wash, Candor Chasma, and so on… We plan to visit those places, thanks for your advice! Today we are going to have our first movie night in Mars, we are so excited for that! There are two main things that the crew are waiting for tomorrow, do an EVA to collect some examples for Atila and David’s experiments. In addition, the Musk Solar Observatory will be used… Can you imagine it? Look the sun from Mars!!! The commander room’s door was locked from inside. David and Atila worked together to open it again! Now we know that a locksmith is a profession in Mars. Reports to be filed: Sol Summary, GeenHab Report, Operations Report, EVA Request, EVA Report, Astronomy Report, Journalist Report and HSO Report. Greetings from Mars!!! After a very long journey we finally arrived to Mars yesterday, where we spent some quality time with the previous crew. Today is our first day managing everything by ourselves, we awoke early at 06:30 for the farewell of crew 186. We are so excited to be in Mars, we started our day talking about the rules and the schedules that we are going to follow during this awesome experience. Then we settle down in our home. One of the surprise of the day was the moment when we opened the food suppliers and found food from Russian Space Food Laboratory… Thank you so much for it! For lunch Oscar cooked us tuna salad and potato… our first lunch in Mars!!! By the afternoon, Dr. Ruppert explain us in detail the protocols that we have to follow and we had our EVA’s training with her. Later, we started to plan the following EVAs. Dr. Ruppert will tell us the final part of the protocols of the simulation in the morning. Later we are going to do 2 EVAs in order to assets the performance of the crew with in suits operations. It’s almost some hours more and we are going to know the feeling of walking and be a part of expedition in Mars. We suspect that there is a leak in the toilet. The water level’s start to increasing little by little but then it works normal again. We hope it continuing working in a good way. Support Requested: Mission Support, please add my email to the e-list of MDRS Mission Support. Mission Status: Preparing for a grand finale EVA to a geology site we have saved especially for our last EVA. Sol Activity Summary: The sun came back out today, much to our appreciation (and the appreciation of our solar panels). Any problem can be fixed in a spacecraft as long as you still have power and comms, and it has been a great weight off our shoulders to only view cloudy days as a mild annoyance, rather than a critical power threat as they might be on a pure solar mission. The clear weather allowed for our last navigation EVA to take place as scheduled. We now have four complete demonstrations of an astronaut using nothing but the radio beacon to safely return to the hab, two where the astronaut had no experience with the system, and an impaired range of vision. I’m very pleased with Justin for producing such a practical aid to navigation in places where no gps is available (such as Mars … for now at least). It’s an early back to school for some of us, as Melanie has begun taking us on short engineering EVAs to test the efficacy of the VR training module she has developed for teaching EVA tasks. Around the hab, we continue to check off the last remaining items on our individual projects so we can face handoff with a clear schedule. On a personal note, today was the first day I really saw GreenHab as more than just a greenhouse. I remember contributing to the Kickstarter campaign to rebuild Greenhab after the fire, and it has made me immeasurably proud to see it continue to thrive and grow under Mark’s skillful control while we are here. Stepping into the tropical heat and humidity of GreenHab today after a cold and dry EVA felt as relaxing as stepping into a hot tub. I sat down amidst the plants to appreciate the magnificent oasis thriving in this red/brown landscape, and the environment was so placid that I was not at all surprised when I woke up 15 minutes later to find I had drifted to sleep in my chair. Greenhouse, oasis, zen garden, GreenHab is much more now than just a place where plants grow. Look Ahead Plan: Our last EVA will take place tomorrow, with one final geological survey to the highest elevation site on our list at the base of Skyline Ridge. Harvesting of our carefully grown GreenHab bounty will also take place tomorrow, we are planning to exit sim at noon on Saturday 01/13. EVA: Preliminary photography of the Plane of Dirt / Skyline Ridge region for the last geology EVA, then walk back to the hab to test the radio navigation system. Sol Activity Summary: We awoke to cloudy skies and a light snow dusting all around the habitat. The snow was still falling by the time we had finished morning yoga and breakfast, so we decided to postpone today’s EVA. The snow let up by the late morning, but by that point, too much time had passed to complete the EVA before our scheduled return time. This will happen on Mars, there is no more a guarantee of cooperative weather there than there is on Earth, and it’s something future crews will have to learn to work around. Instead we broke out our blankets, sleeping bags, and laptops, and spent the rest of the day working on our own projects. We shared an all crew lunch of mac-n-cheese prepared by Melanie (which was a nice departure from routine, as we are usually on our own for lunch due to EVA scheduling). GreenHab is nearing harvest time, and two dinners from now we are planning a green feast of its bounty of microgreen, lettuce, beans and herbs. And we were even happier to receive a radio call in the afternoon indicating a supply ship had delivered us a new bread maker! We have set it up in our kitchen, and are planning to break it in (de-flour it?) at dinner tonight. Look Ahead Plan: The uncompleted EVA 8, scheduled for today from 1030-0130, will be rescheduled to tomorrow from 1230-0330, which is after the rain/snow is forecasted to have stopped and the temperatures will have risen above freezing. Sam Albert will also be replaced with Mark Gee as the lost astronaut, but the route and objectives of the EVA remain unchanged. Support Requested: The snow and sleet can be heard falling through the vent holes at the escape hatch at the top of the habitat. We have put two old dish towels across the chicken wire to catch it and keep the wooden floor of the attic dry. Is this acceptable as a permanent solution? Mission Status: All but one of our target EVA sites have been reached, and we are now revisiting sample sites we weren’t able to hit on the first visit. We are also making sure our individual projects will be finished by the end of the mission (just 5 sols from now!). Sol Activity Summary: Our last EVA to the Moons region was cut short, so we revisited each of the Moons regions and collected a sample of the clay and salt at each site that we had not been able to get the first time. The color contrast from region to region was remarkable to behold; blues, reds, yellows, greys, all due to just small changes in soil chemistry. After we got within 2km of the hab on the way back, we dismounted and tested the radio beacon system to navigate the rest of the way home. Justin and Kshitij then ran a quick three sorties back on the rover to recover the ATVs. Once we were all back at the hab and warmed up, we did some planning for a media event the entire crew will be participating in 2 days from now for students and faculty back at Purdue. Mark spent the day in GreenHab composing some documents to aid future GreenHab officers, Melanie continued the programming of her VR training module, while Sam and Cesare caught up on their own experiments in the science dome. Look Ahead Plan: Today was the first completely successful test of the navigation system on EVA, we will attempt to replicate the results tomorrow under more challenging conditions on a shorter EVA. The weather forecast is looking less favorable for the next 48 hours, so all EVA plans will be weather contingent. Sol Activity Summary: Today was a follow-up EVA east of the Maxwell Montes area to try and get up close to the stratified cuts in the canyon wall that we found on EVA 3. The USGS topo maps that we had downloaded before our mission made navigation through the canyon possible, but still error-prone. We were not able to reach the stratified layer feature we had previously located, but we did locate another wall along the way in a side canyon with an equally good stratified structure and elected to conduct our sampling there instead of continuing on to the target site (which was still 0.5 miles away). As this canyon is just off the edge of the MDRS map and has no feature name, we have elected to informally name it after our college mascot, Boilermaker Canyon. See the EVA report for more details on navigation. Tonight we plan to make time for some astronomy and an early bedtime. Look Ahead Plan: Tomorrow’s EVA will revisit the Moons region to target the sites we missed on the first visit to the region, then conduct a walk back experiment with the navigation equipment. Anomalies in work: The commander experienced communication troubles on this EVA when a radio battery started giving a low voltage warning while en route to the site. By turning the radio off and only turning it on when communications were required, we were able to extend its life until we reached the EVA site. But it meant that the commander was required to always remain within easy reach of another crew member so instructions could be relayed to turn on their radio via hand gestures or simulated helmet contact. As the commander was responsible for navigation, the commander and engineer swapped radios on the way back and walked single file with the incommunicado radio in the 2nd position in line, ensuring the commander had good comm and could direct the navigation out of the canyon. HSO also experienced a loss of radio comms while walking back to the rovers, but this was traced back to the radio inadvertently being placed in scan mode. Communications were restored once this way corrected. As this is now the second time an apparently fully charged radio has failed to hold charge on EVA, we are implementing a new policy on all our future EVAs that 2 fully charged spare radios will be put in the EVA box, and carried with the EVA team at all times, to be swapped in the event of a low radio battery. This was the most physically intensive EVA we had conducted so far, and we made use of the reserve water supply once we returned to the rovers, drinking it through a camelback to avoid breaking sim. See the EVA report for full details. EVA: Muddy River Canyon east of Maxwell Montes, 5.0 hrs, spectral and geological sampling of the stratified layers in the canyon wall. Mission Status: Enjoying our first day of light duty and the chance to catch up on our individual work. Sol Activity Summary: As grad students, soon to be grad students or recently escaped grad students, one of our greatest pleasures is to sleep in. And today we did just that, in celebration of reaching the midpoint of our 13 sol mission. We woke on our own schedule, and enjoyed a brunch of scrambled eggs and french toast. We recommend a new standing policy be implemented on Mars missions: AHTBMR, aka, “Always Have The Bread Maker Running”. A passing comment about Game of Thrones (which GreenHab officer Mark Gee had finished reading that morning) became an engaging discussion about authorial intent and the discernment of canon in fictional universes, over the course of 2 hours spanned such topics as the Star Wars Holiday Special, Ender’s Game, the Bible, and literary theorist Roland Barthes’ essay “Death of the Author”. In the course of the discussion, I was reminded of a remarkable question that only future Mars colonization will answer: How will future Martians view our current stories about Mars and the people who live there? Will characters like John Carter, Sax Russell, Rebecca Sherman, Mark Watney and Bobbie Draper become modern myths to the new Martians? The exploration of Mars is the first instance of humans building a culture on top of a preexisting shared mythology in fiction. Will future Martians adopt that existing mythology as their own, or will they decide to make unto themselves a new one? 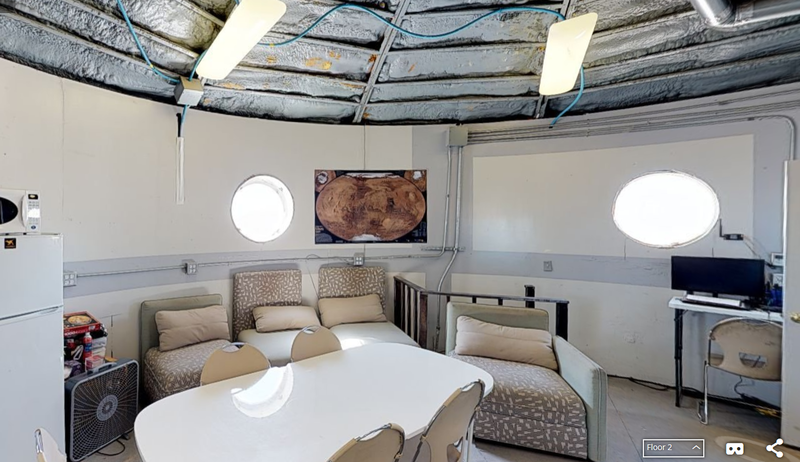 We spent the rest of day relaxing around the hab, tending to our own experiments in the science dome and in GreenHab, and driving the NorCal Mars Society Rover around the hab (the rover was confronted by a 4 legged alien that retreated as soon as the rover advanced towards them. Photo of it is in the journalist report, awaiting identification). After sunset, sleet started to fall, and we settled in for a nice dinner and game night, featuring a custom card game designed for our mission by our Crew Journalist, Justin Mansell. 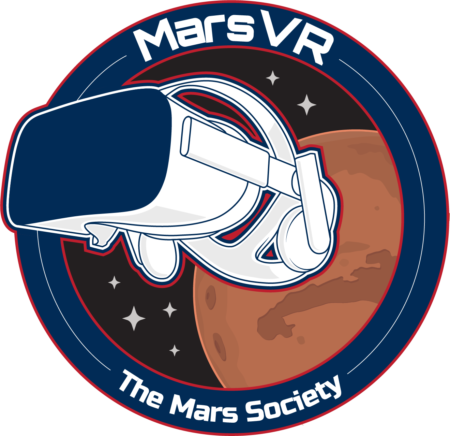 The rules of “Mars Quest” are coming in a separate email if you want to follow along at home! Look Ahead Plan: The sleet has made the ground icy around the hab, and even though the weather for tomorrow is forecasted to be clear, we won’t do an EVA if the ground is icy. But if conditions permit, we plan to revisit the region North East of Maxwell Montes that we visited on EVA 3, as we believe we have found a walking route on the topo maps that would allow us to enter the mouth of the canyon from the south, and access the stratified layers we could previously only photograph from the canyon’s west rim. Anomalies in work: None (generator and water consumption issues believed to be resolved). Sol Activity Summary: We awoke today to Hans Zimmer’s “Elysium” from the movie Gladiator. Clouds had rolled in as forecasted, preventing the solar panels from being used for daytime power. The generator had failed during the night, and while it was easy to restart, it took a few attempts before it kept running for more than ~10 seconds. We suspect it simply had to warm up, but our reducing the hab power load before turning on the generator may have also helped. After breakfast, we prepared for our first 5 crew EVA to Greenstone Rd to continue the hunt for the hematite blueberries that had eluded us on our first and second EVA. After suit up and a brief radio discussion with Shannon, we decided to drop the navigation component of the EVA and focus on pure geology. Unfortunately, although we spent almost 3 hours on site with 5 pairs of eyes, and obtained multiple geological samples and spectra from around the area (including from the laser spectrometer generously lent to us by NASA Ames) we were not able to find any Hematite Blueberry formations. This evening, we got our first positive results from Sam’s microbe DNA experiment after swabbing around the hab. The PCR machine will continue to run throughout the night, and we eagerly await tomorrow’s results! Look Ahead Plan: To commemorate reaching the midpoint of our mission, tomorrow will be a light duty day of Hab upkeep and catching up on photo/video uploads and emails, followed by some R&R. No EVAs are planned for tomorrow. Support Requested: The generator failures are concerning, as we have no way to detect them unless someone is outside or in the science dome to hear the generator turn off. We can schedule a round of hourly checks, but it would interfere with our sleep schedule. Any recommendations on ways to prevent/detect the generator failures? Our water conservation efforts are probably not going to be sufficient, as we are projecting a ~1 sol deficit in our initial allotment of 550 gallons. Of this, 40% is going to Hab usage for drinking, washing and hygiene, 7% is watering our crop experiments, and 53% to watering the crops that were present in GreenHab at handoff. Would it be possible to schedule a water resupply so that we can ensure no interruption to the crops? Tomorrow we plan to catch up on the photo/video backlog that we have developed. We have heard conflicting reports on upload limits during regular hours. Is it truly unlimited, or is that a mistake? Sol Activity Summary: Geologically, Earth’s moon has very little in common with Mars. The geological processes that have shaped the surface of our Moon (vulcanism and impacts) are very different than the geological processes that have shaped the surface of Mars (water and wind). But sitting in an intriguing middle ground are Mars’ moons, Phobos and Deimos. By most metrics, Mars’ moons are fairly typical asteroids, but their proximity to Mars has caused their surfaces to become blanketed in Martian material kicked up by asteroid strikes and swept up by the moons as they snowplow through the space surrounding the planet. As three members of our crew have done thesis level work on how hard it is to land on Mars, we are acutely aware that the first Mars sample return mission may not sample Mars at all, but rather, the impact debris that Mars has deposited onto its moons. In this theme, today a team composed of Cesare, Melanie, Sam and Mark conducted an EVA to the region 5 km North West of the Hab known as “The Moons” (Yellow Moon, Beige Moon, Gray Moon and White Moon). Last night, Cesare gave the entire crew a seminar on the geology of the surrounding area so we could be on the lookout for interesting features on geology EVAs like this one. We had originally budgeted time for three stops in the region for spectral measurements and sample collection, but the process of strapping the expensive and delicate equipment to our ATVs meant our estimates were incorrect, and we reached our turnaround time after only sampling one. So we must add this site to the increasingly long list of sites that will get a follow-up in a later EVA. Far more science to be done than scientists to do it will be part of a real mission to Mars, but it doesn’t make that constraint any easier to accept! When the EVA team returned, they were greeted by the sight of the NorCal Mars Society rover wheeling out to meet their ATVs. The rover was successfully navigated for three complete circuits of the campus while the team was out. The ideal Mars exploration mission will utilize robotic resources of every kind (orbital, airborne, and surface) and it’s good to have at least one of those joining our mission. This evening, Mark took us on a tour of GreenHab where the microgreens he planted 2 days ago are already starting to sprout. Flowers from GreenHab already adorn our dinner table, and near the end of our mission, we expect GreenHab’s food will too. 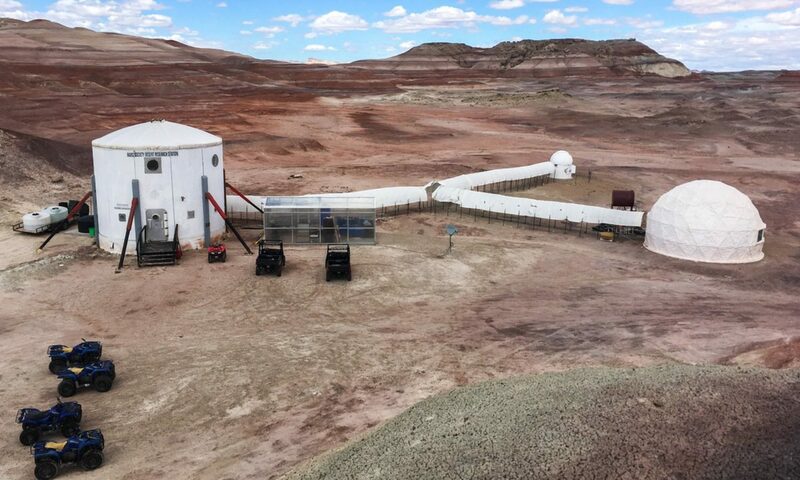 Look Ahead Plan: In an attempt to check off our science goals more rapidly, tomorrow’s EVA will be a hybrid geology and navigation EVA along the southern end of Cow Dung Rd. The geology team will explore sites south of kissing camel ridge, and drop off the navigation team to attempt a walk back under limited visibility conditions with the navigation beacon. Anomalies in work: ATV 300 wouldn’t start this morning. We tried starting it again after returning from EVA, after it had been sitting in the sun for 2 hours, and it started up as expected. It was probably just too cold. Support Requested: We are exceeding our maximum daily water consumption target of 40 gal/sol as GreenHab operations ramp up, and are implementing tighter controls on water use to allow GreenHab as much water as possible. We are considering implementing a “3 bin” dishwashing system, any other recommendations on effective water saving strategies would be welcome.